John McGinn, Tammy Abraham and Conor Hourihane scored in the second half. Following the Championship's club's best win in over six months, they now turn their attentions to local rivals Birmingham City. "It gives everybody a boost. 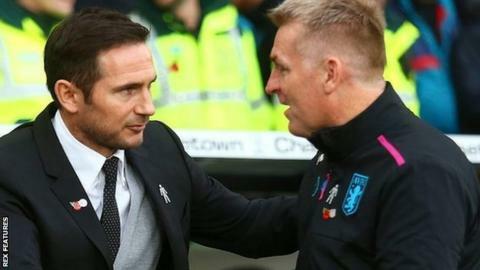 You could hear the supporters all the way through the game," the head coach told BBC WM. Villa's biggest victory since winning 4-0 at Ipswich in April was a third win in five games for Smith - his first away points - and lifts his side a place above Blues going into the home derby on Sunday, 25 November. And it is no coincidence that came after the first full week Smith and his assistant coaches Richard O'Kelly and John Terry had been able to enjoy with the players. But it may prove harder to do that in the build-up to the Blues game as Villa now have 12 players on international duty. "We haven't had loads of time in the time I've been here," said Smith. "And this week it's the international break and we've now got 12 away. "Not all teams play the way Derby do. You have to come up with different ways to beat different teams. But the lads have upped the tempo to make themselves better. "This result was down to what they've been doing in training. We've been working really hard every day. Not just the one who are starting but the rest of the squad too."